When you combine my two favorites – pizza and pesto – you have a winning combination. 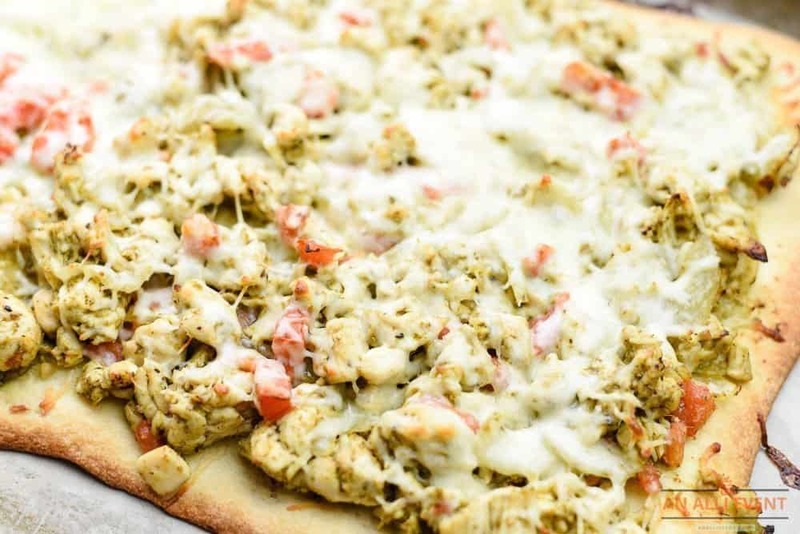 Chicken Pesto Pizza takes pizza to a whole new level. When the kids were small and my husband was finishing Bible college, he went to school during the mornings and straight to his job as a manager at the Tulsa World and Tribune. He often worked late hours, so every Friday night was pizza and a movie night for the kids and me. Back then, we had pizza delivered from our neighborhood Pizza Hut. When we moved back to the southeast to a small town in the Carolinas, the kids wanted to resume our Friday night tradition. I had to break it down to them that we were not in Tulsa any longer and there was no pizza delivery out in the country. So, we’d have to make a pizza run. Eventually, the kids grew up and Friday night lights replaced our pizza night. These days, I like to make my own pizza. I rarely make homemade dough. 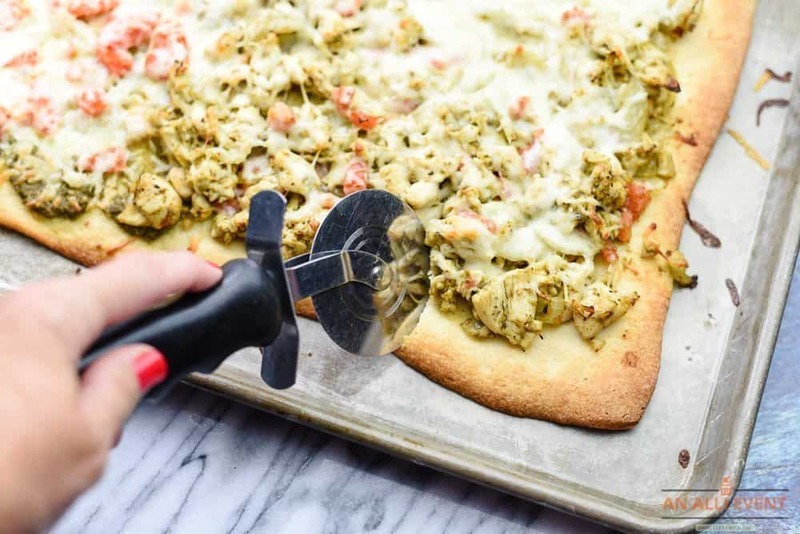 I use Pillsbury pizza dough from the refrigerated section of the grocery store when I make Chicken Pesto Pizza. You could make your own dough, of course – whatever floats your boat, but this one works fine for me. If you’re using the Pillsbury pizza dough, heat the oven to 400º F. Grease a cookie sheet and unroll the dough, forming it to your desired shape and thickness. Prebake the dough for 8 minutes. While the dough is baking, spray a large skillet with cooking spray. Add chicken cubes and cook on medium, stirring often, for 2 minutes. Add thinly sliced onions and pesto. Cook and stir for 3-4 minutes or until the chicken cubes are cooked through. Stir in diced tomatoes. Remove from the heat and cool slightly. Helpful Hint: For this recipe, I use premade pesto. Of course, feel free to make your own. Spread chicken mixture evenly over dough to within an inch of the edges. Sprinkle with shredded Italian cheese blend. Bake for 10-12 minutes or until crust is golden brown. Heat oven to 400º F. Spray a baking pan with cooking spray. Unroll pizza dough onto cookie sheet. Form to desired shape and thickness. Meanwhile, spray a large skillet with cooking spray. Add the cubed chicken and cook over medium heat for 2 minutes, stirring frequently. Add onions and pesto. Cook and stir for 3-4 minutes or until the chicken is cooked through. Stir in tomatoes, remove from heat and let cool slightly. Spread chicken mixture evenly over the dough, within 1 inch of edges. Sprinkle with cheese. Bake 10-12 minutes or until crust is dark golden brown. This is one of my favorite pizzas. I think I’ll invite my grown kids over and resurrect our old Friday night traditions. I enjoy making pizza that isn’t your traditional stereotype with red sauce and sausage or pepperoni. I have some leftover chicken in the refrigerator and it is Friday pizza night. Sound perfect to me. I totally just bookmarked this, I love chicken pesto pizza! I’ve never tried to make it myself, though. This will be the perfect dinner for this weekend! This looks belong delicious! 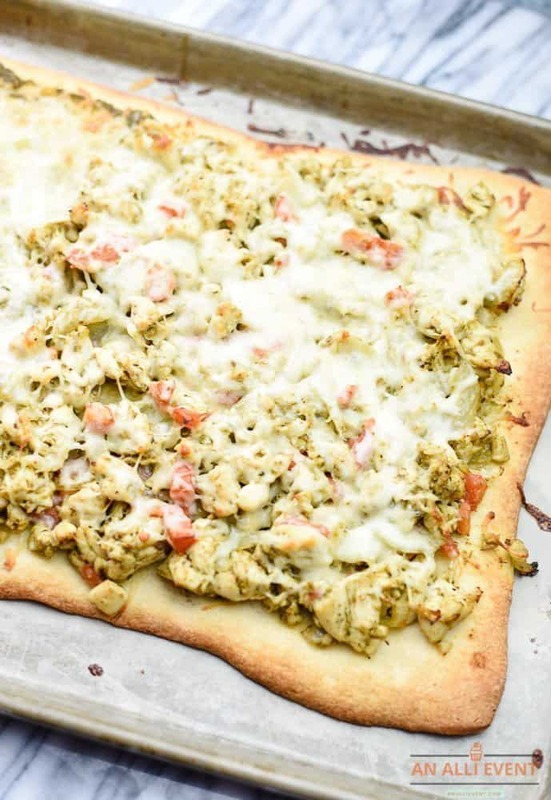 I have not tried pesto chicken on pizza before, but it is such a great idea! My mouth is watering just thinking about making this! We LOVE Pillsbury thin crust pizza dough. It’s so easy to use and its good. This recipe is right up my alley. 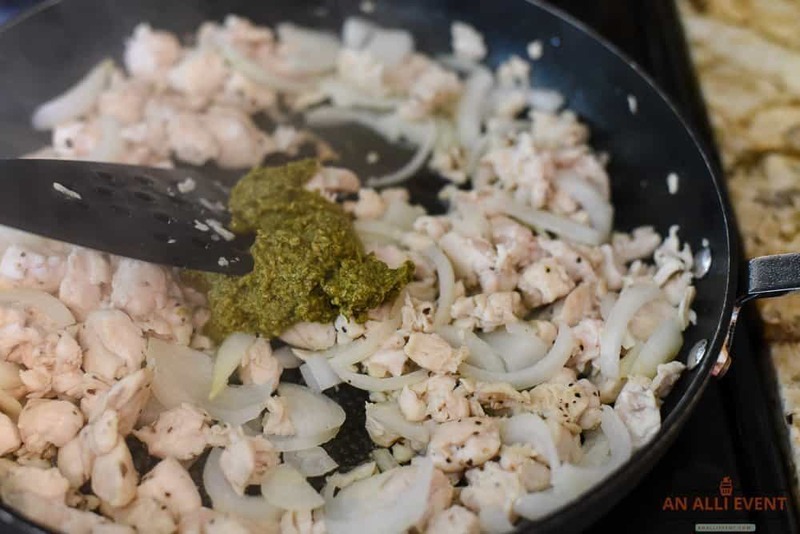 I love the taste of pesto and chicken together. Pinning for late. Ooooo! I love that this starts with a store bought crust. I just don’t have the time to make pizza dough these days. I know my family would be so happy if I put this on the table! This does look incredible. We love pizza for dinner. I’m going to try this one night. The flavor sounds tasty! I make breadsticks with pesto and mozzarella, but never thought to make it into a full blown pizza! We will definitely be trying this ASAP, since we love pizza and we love pesto! Pizza is my weakness and nothing beats homemade. As a pesto fan, I can not wait to try this! This looks seriously amazing. Pesto sauce does not get enough attention! This sounds sooooo yummy. I am all for pesto on any type of carb. But add melted cheese and I’m yours! my daughter loves pesto so I am going to try this on her!! That pizza looks delicious and it’s great to have a homemade pie crust. I will have to try that kind of pizza dough. I love anything with pesto but unfortunately my family isn’t crazy about it BUT, they might like this as it is pizza. I don’t eat meat but I love pesto! I bet my family would love it if I made this for them. This pizza looks super delicious! I would love to make this for my family. I love pesto! Especially since it’s easy to make and versatile as well. This is something that I’ll definitely enjoy! Thanks for the recipe! This is why I adore making pesto! It goes so well with different recipes and it tastes amazing. Love this kind of pizza. I’m definitely keeping the recipe! Thanks!